The latest project by Natura Futura Arquitectura with Frontera Sur Arquitectura in the town of Huaquillas, Ecuador is a virtuous example of the social role that architecture plays both for whoever uses the house and for the entire community. 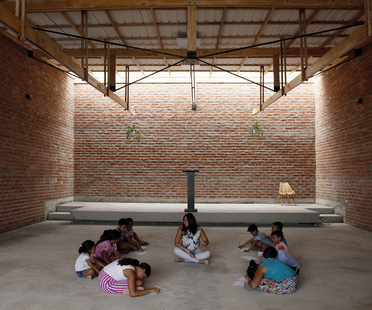 The architects from Ecuador-based studio Natura Futura Arcquitectura created a “House of Prayer” in Babahoyo, in the Los Ríos Province. The architects from the Ecuadorian firm Natura Futura Arquitectura have created a greenhouse using local materials and as a self-building initiative in Nayón, near Quito, with the partners of Huertomanías, a cooperative whose members have some mental health problems. Natura Futura Arquitectura and their latest project - with Ruta4 from Colombia - have created an installation that is a tangible manifesto of the community, landscapes and strategies for local revival, all as part of the TSL Canoa 2017 workshop in Ecuador. 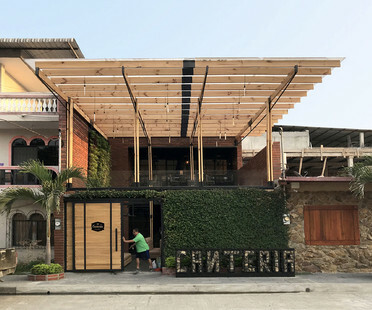 The young architects from Ecuadorian studio Natura Futura Arquitectura worked with local residents to refurbish a fishmonger's in Babahoyo in the province of Los Ríos, Ecuador. With “El Portal Invisible”, Ecuador-based architecture firm Natura Futura Arquitectura has declared its love for the natural landscape, by building an invitation to sit back and indulge your senses in a contemplation of the western slopes of the Andes.